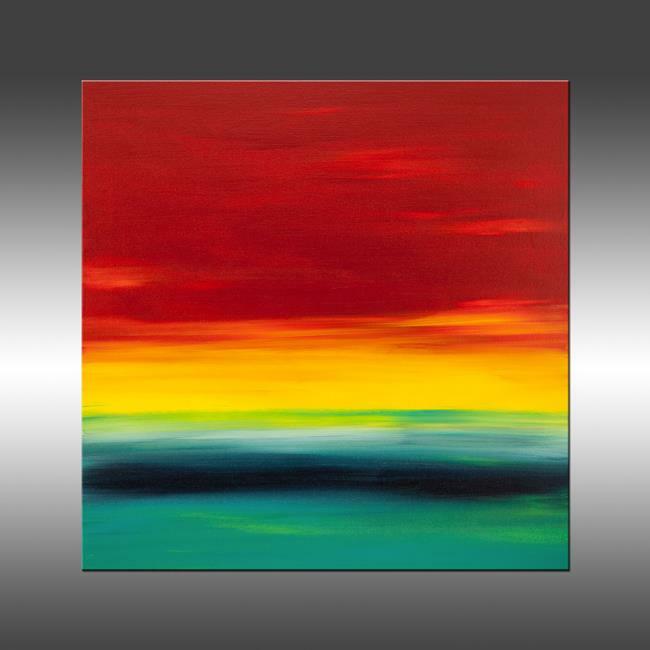 Sunset 29 is an original, modern art painting from the Sunset series. The Sunset series is a collection of square 20x20 inch mix and match paintings. You can hang them separately, or purchase multiple paintings to create your own custom collection! This particular painting, along with a few other paintings from the Sunrise collection, was inspired by the stunning sunsets in Kona, Hawaii. This one-of-a-kind painting was created with acrylic paint on gallery-wrapped canvas. It has a width of 20 inches and a height of 20 inches with a depth of 1 inch (20x20x1). The painting continues onto the edges of the canvas, creating a finished look so the canvas does not require a frame. All of the Sunset series paintings continue onto the edges of the canvas. The painting has been signed and dated on the back and can be signed on the side or the front as well, if you'd like. Just send me a quick message to let me know. The colors used in the painting are red, yellow, green, blue, teal, and white. An archival, UV resistant, gloss varnish has been applied to protect the surface of the painting. The painting has been signed by Hilary Winfield and a certificate of authenticity will be included with the shipment.